Distance: Walk 5 is 13 km, but allow more than the 5 ½ hrs average time! Notes: hunting is allowed on certain autumn days between 6-8 AM and after 6PM. Stay on the marked paths! Many of these paths are quite rocky so good sturdy shoes are a must. 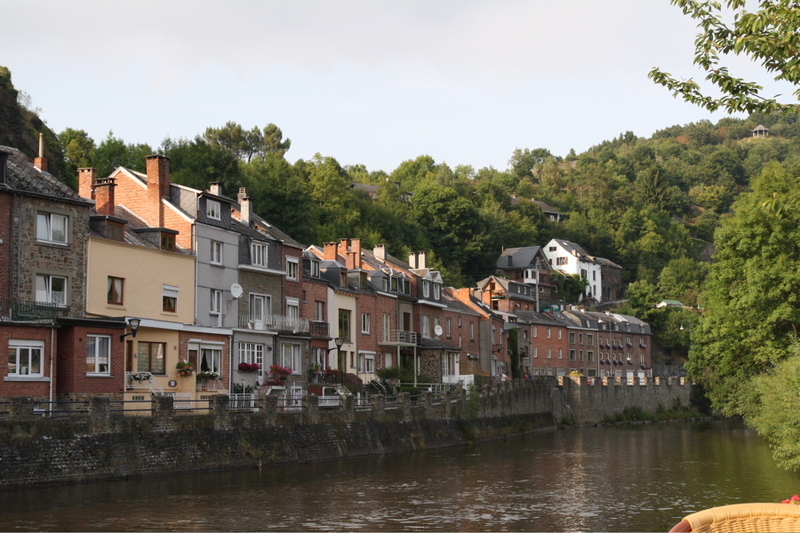 Where else but in Belgium could you hike up a mountainside through leafy woods, have a coffee break/drinkypoo just when you feel you could use one, and find a chocolate shop waiting for you in the village at the top? 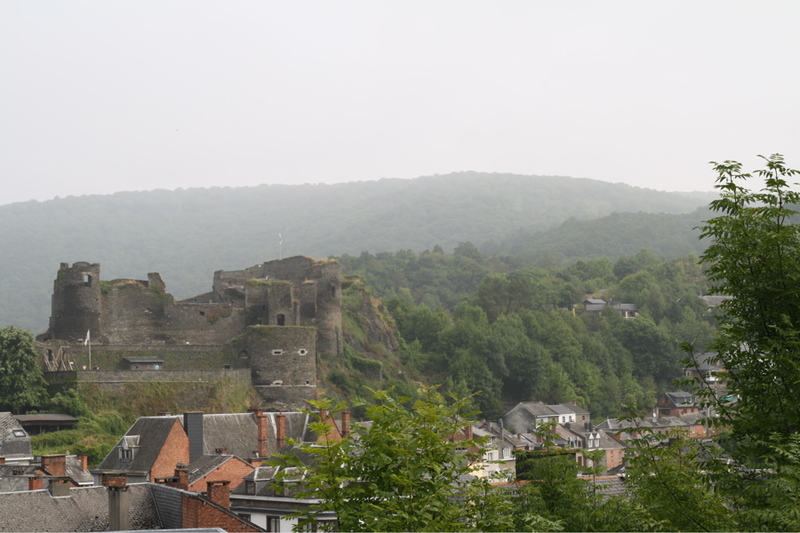 It was as if the Vacation Fairy had read our minds and conjured up La-Roche-en-Ardenne. 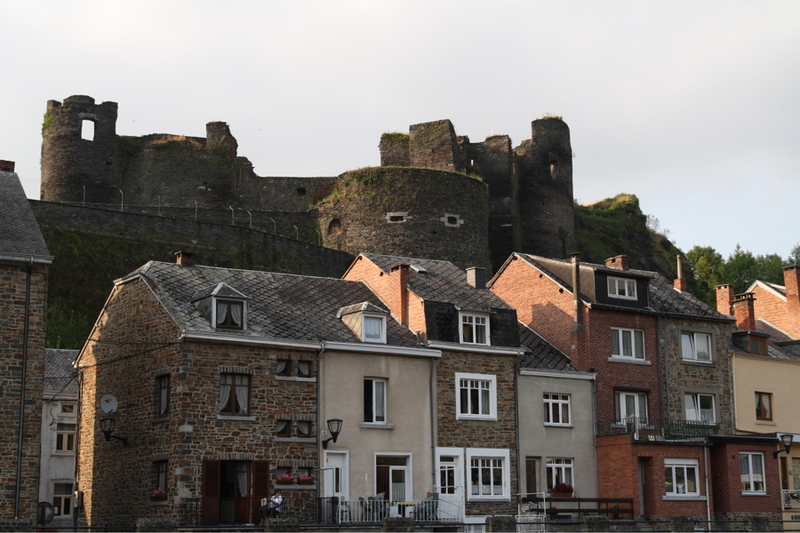 It combines outdoorsy opportunities with commensurate food and lodging and is über-picturesque to boot –the ruins of a medieval castle crown the peak above the town, situated along a bend of the river Ourthe. There are activities in town: you can watch leather-gloved boys demonstrate falconry on the castle grounds in summer, and there is a game park as well as museums of grain milling, ham (really! ), and the Battle of the Bulge. For walkers, two GR routes cross here, and there are many well-marked local walks providing dramatic views. You can also cross-country ski, kayak, or paraglide off a cliff if so inclined. Be warned, the town proper can be overrun on a weekend in summer but once you get off the main drag it is generally still quiet. The castle, which dates from the 9th century, is worth a look; excavations only started in 1995 and new things are being discovered all the time. It’s up a short flight of steps off the main street, a good warm-up for any real walk. If you’re not intrigued already, how about this: there’s a soup festival, held on a weekend just as the autumn chill hits. Five euros buys you a souvenir cup which you can fill to your heart’s content from the contestants’ kettles, and on Sunday the winner is declared. Any of the numbered walks starting in the town center has the advantage that it goes uphill first before coming down, so as a rule you’ll have finished with the hard work once you’re up (10 is an exception as we learned the hard way). Gastronomy: La Roche’s specialty food shops, all on main street rue de l’Eglise, take care of bread, meat, cheese, and wine. There are two supermarkets, but we would encourage you to be closer to the producers, you shouldn’t need them unless the fruit/veg shop is closed (as of April 2010 it looked permanently closed but we’re hoping this was just a vacation). One of the most characteristic sights of the region for many people is these shop windows chock full of ham. 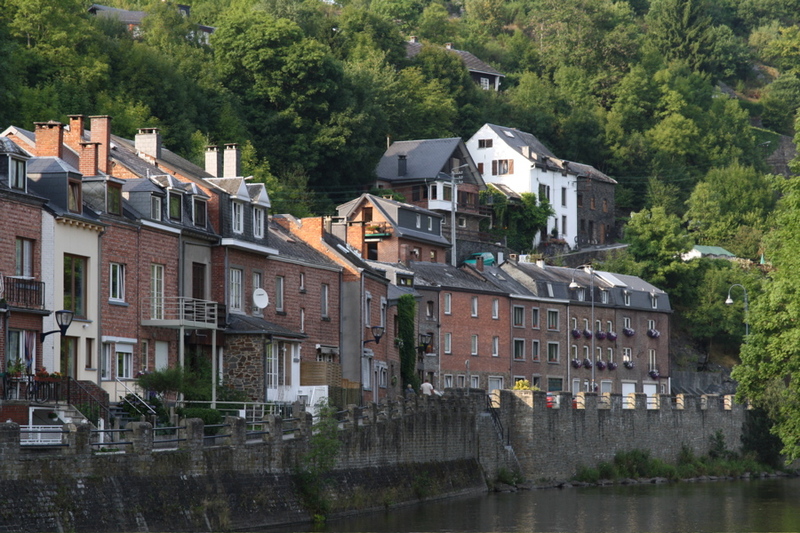 The Ardennes abounds in ham (and all this ham finds its way into pretty much everything but dessert, making the region a difficult though not impossible option for vegetarians) and La Roche is no exception. It doesn’t have a cheese shop per se, but cheese can be gotten at any of the ham shops – can’t miss them. They all have a small but representative cheese selection. If you do like ham, you really should get into it here. There’s the square-shaped loaf of jambon d’Ardenne, and the noix d’Ardenne, a smaller and denser ‘nut’. One unusual ham is the non-smoked (non fumé) variety. Most regions of northern Europe seem to have a preference for either smoking or air-drying meat, but here they do both. It’s got an almost gamey but subtle and rich taste. Mr. Bowtie is especially fond of spicy landjaeger-style Ardennes sausages, as sold by the butcher Maison Bouillon et Fils, Place du Marché 9. Make sure to ask for piquantes. La Cave du Vénitien at 28 rue de l’Eglise has a wine section including a number of half-bottles, and many artisanal products for gifts. (They also have a lot of beers, but if you hike up a mountain with one you’re likely to lose most of it as foam.) They also stock some fine chocolate bars if you can’t get to the summit. Across and to the north is Le Caveau de Bacchus if you want to look for more whole bottles. Four bakeries all do good pain gris as well as French-style breads. The Boulangerie artisanale Lambert on Rue de la Gare, at the corner with the bridge, sells only whole largish loaves, not halves or quarters as many do. They’re very tasty: dark-crusted boules with a luscious light crumb. If you have a crush-free way of transporting pastries, go for it. There is even an organic shop right on the main drag with a small selection of edibles. If you don’t want to pack a picnic, you can eat in town before ascending to the peaks. There are many lunch options, all on the main street, besides French-style including Chinese, Balkan, Italian, and “natural”/gluten-free. Note that Samrée (see below) has no restaurant or café. The walk: The tourist office sells a good map of walks starting in town, which also shows the two GR routes. The local walks are well marked, so if you don’t want to buy a map (but we are not responsible if you get lost), just look at the sample taped to the counter towards the back to get an idea of the terrain and starting point. Number 5 starts on rue Clérue (head south on the main drag from the tourist office, then turn left before the bridge – follow the red diamond signs). Note that besides the number and symbol the signs will have arrows pointing in a suggested direction. Of course you’re free to reverse it, but sometimes they’re planned so that you’re more likely to avoid, say, an exposed climb in hot sun if you follow that direction. Do have a look and consider the weather; you may want to choose a route with more shade or sun, depending. Start out on walk number 5 (or 4, but 5 gives a slightly more dramatic view), which rises steeply once you’re out of town proper. Probably right about the time you start thinking you could use a coffee or something cool and refreshing brewed from pure Ardennes river water you’ll arrive at the game park (‘Parc a Gibier’, 10 hectares of semi-captive wildlife). You don’t need to pay admission to enjoy a drink. In summer the trees hide the long view but this is can be made up for by a cold Lachouffe – on tap here, need we say more – on the terrace. In winter you can warm yourself with a hot chocolate or something stronger indoors by the fire. Mr Bowtie never leaves without buying a few of their little dried sausages to go, and grabbing a few packets of mustard. Ask for saucisson d’Ardennes. At the game park, route 5 join route 4. After 4 descends back to town, follow 5 up to the village of Samrée. It’s forested and fairly shady going up, and on a hot day it’s nicer taking the suggested direction. There is a bench – with view! – on either side of Samrée. There are no restaurants here, only…wait for it… an artisanal chocolate factory, Cyril (www.cyrilchocolat.be, just off the marked route at number 63; tel. 00 32 (0)84 / 46.71.20). We couldn’t have made this up if we’d wanted to. Bonbons (pralines in French), a range of high-octane bars with up to 95% cocoa solids, even organic bars. They have a tea room open Saturdays only, and the shop is open Tue-Sat 13-18. Not a huge variety, but if you like chocolate there’s bound to be something for you. Enjoy! If you want that ‘Chouffske’ you skipped on the way up, or another one, go back the way you came on the 5 and get it at the Parc. If you want a change of scenery, take route 2 at the area called ‘Pranguleux de gros chene’ (curiosity no. 9 on the map) if coming the ‘wrong’ way from Samrée and you may see the bucks displaying some stupendous racks of antlers in the back of the game park. Descend into town and you’re back on the main drag with plenty of options for refreshment. Let’s face it, you deserve it. Another walk: Walk 10, although it has an unbelievable amount of up and down that gets old toward the end, has a superb spot for a picnic not far from its start. If you’re starting out early, or if you’re packing a picnic supper, go in the ‘wrong’ direction and you can eat at the end. It’s sight number 25, the ‘Cross of Jerusalem’. The description may get you thinking you’ll see an ancient battered thing brought back from the Crusades. In fact it still looks pretty good, because it was carried along the Via Dolorosa in Jerusalem in 1905 and brought back. It was placed on a beautiful hilltop from which you can enjoy a wonderful view of the surrounding countryside. Go up on route 10 (the same as 9 for a while). Keep going on 10 where 9 goes into the village of Beausaint, and you’ll get to the cross. You can make this 11.5-km hike into a shorter one (say 5km total) by backtracking after the cross to the junction with the GR57, going downhill for about 500 meters and turning right on route 10 going towards town. Dining/lodging tip: There are many places to eat, most of them touristy, in town. You can eat well and sleep on the GR without town noise if you walk 800 meters uphill from the center, to Les Olivettes (lesolivettes.be). Take the rue de Bon Dieu de Maka, which becomes Chemin de Soeret, up the hill. The fixed-price petit menu de terroir (or ‘country menu’ on the English site) is a true bargain at 20 euros, ditto for menu de terroir at 25. Chef and co-owner Christine cooks unfussy but delicious cuisine grandmère in portions fit for a mountaineer, and since they only make what they need, you’ll need to reserve. Do it. Les Olivettes has dozens of horses (and they organize outings), plus there are many resident and guest dogs (it may be the only hotel around that accepts dogs; at our first time there every party had at least one), cats, fish, and a wild boar living in the stable. Orphaned little Victor grew up running around the house with the dogs. When he got too big and dangerous-looking, he was turned out of the house and had to live in the stable, which apparently made him very depressed (they’re sensitive and intelligent creatures). He’s very sweet. We fell for him completely. If you’re there in the morning you might be able to say hi as he gets tucked in for bed. At least take a look at his pictures in the bar.